Whenever I saw someone with a pixel version of themselves for an avatar, I always got slightly jealous. I even got as far as finding out how to make one for myself on Photoshop, but it still looked kinda lame. Fortunately, new avatar creation website eightbit.me has come to the rescue, allowing you to create your geeky self in 8-bit pixels. Although avatar-creation sites are nothing particularly new, eightbit.me is easy to use and fun. Maybe it's the fact that Web figures such as entrpenuer Kevin Rose flashed his avatar on Twitter months before the site opened to potential users, causing a slight buzz, or that instead of Flash, the site runs on HTML5. Plus the website looks pretty awesome--moving pixels everywhere! However, the site also has a few tricks to keep it going longer than the average generator. Rather than making just an avatar of your face, the website allows you to set up your whole body. 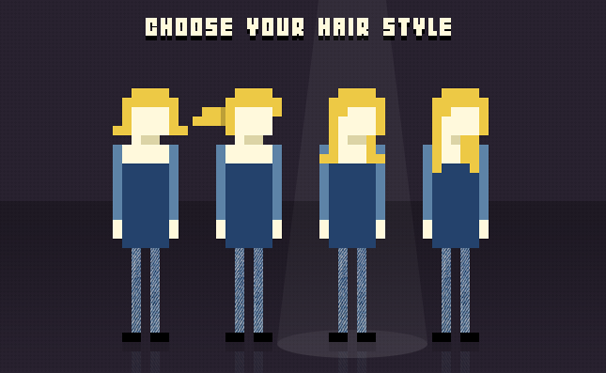 You can recreate pixel chic from head to toe, in a range of colors and styles. The headshot version will then be automatically uploaded to Twitter (if you don't deselect the option at the end of creation) and you can go back and change yours whenever you want. Plus, there's a a choice of listening to some funky 8-bit music while you create. The reason you get a full body pixel figure is due to an iPhone app imminent for release on March 9. Unfortunately, details on the app are quite vague, but it looks as though your pixel character will be running around in an equally 8-bit world game. The downside is the website is still in beta mode because of the app and updates to the avatar creation (more outfits, hair styles etc), so you will need an invite to give it a go. The upside is, GeekTech has found a day pass: Just follow the app lauch link to give it a try for yourself (the link may only work for a limited time, and required you to log in using your Twitter account). If you have Twitter, tweet us your avatar!